Im Prinzip kann man hier nun seinen Server mit Modulen etc. bestücken. 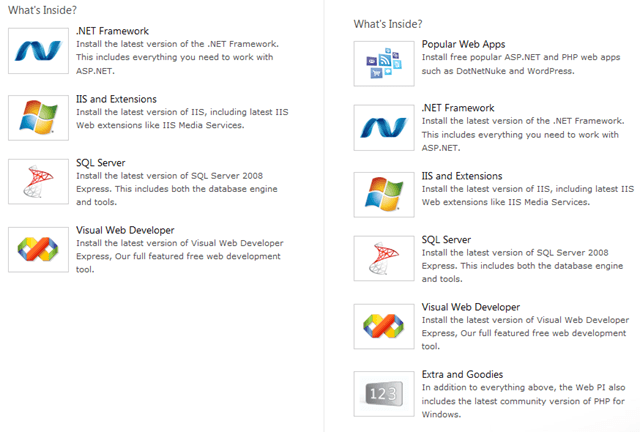 IIS Module, SQL Server, Tools, PHP etc. Mit wenigen Klicks lässt sich so z.B. ein Wordpress installieren. 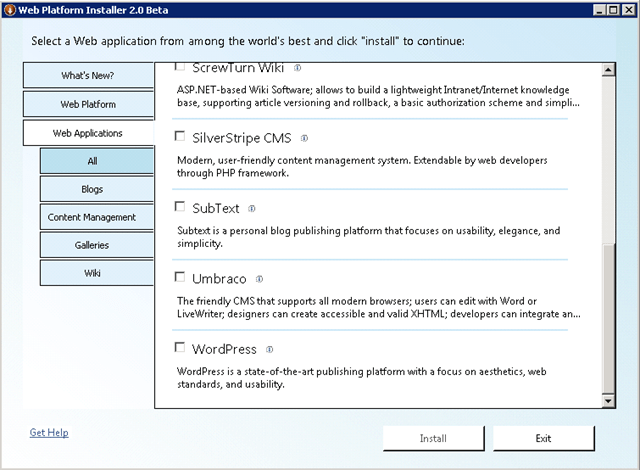 Wordpress hat z.B. allerdings einige Abhängigkeiten, z.B. PHP und das URL Rewrite Modul sowie Settings die nach der Installation ausgewählt werden müssen. 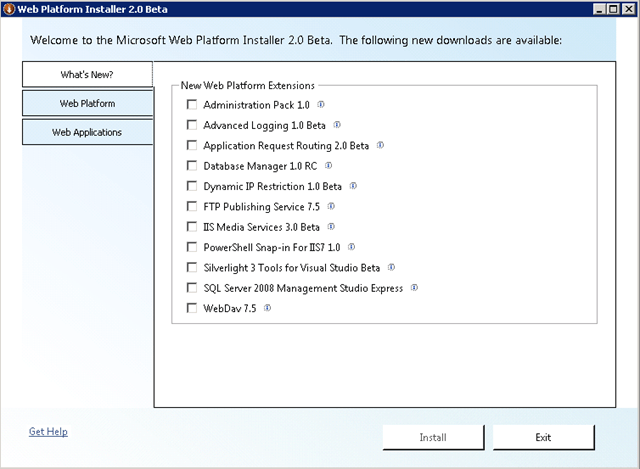 Der "Web Platform Installer" führt alle notwendigen Schritte aus und lädt die benötigen Teile runter. Die Anwendungen die dort angeboten werden müssen nicht von Microsoft runtergeladen werden, sondern es dient nur als Applikations Repository. 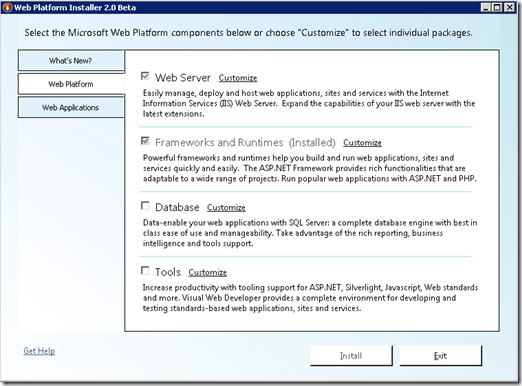 Be Current: The application you provide a link to must be the latest, stable final release version available, hosted on a publically available Web URL. 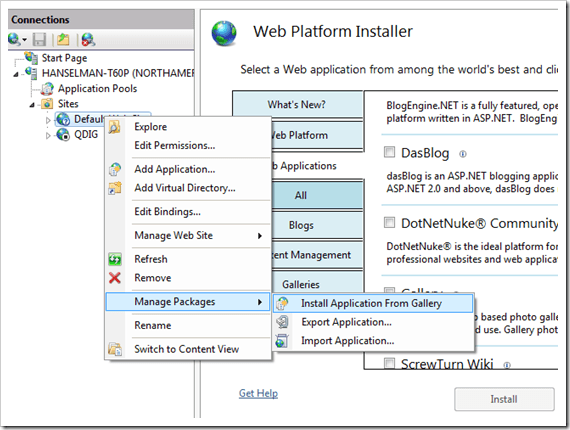 Be Free of Charge: The application for which you submit a link to the Windows Web App Gallery must be provided free of charge and fully functional without time restrictions. You are welcome to charge for professional support or consulting services and/or provide an enhanced, enterprise version of the application for purchase on your site. 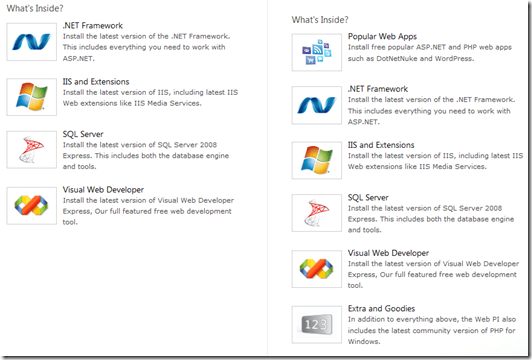 We will be happy to provide a link to your commercial products and services from your page in the Windows Web Application Gallery. 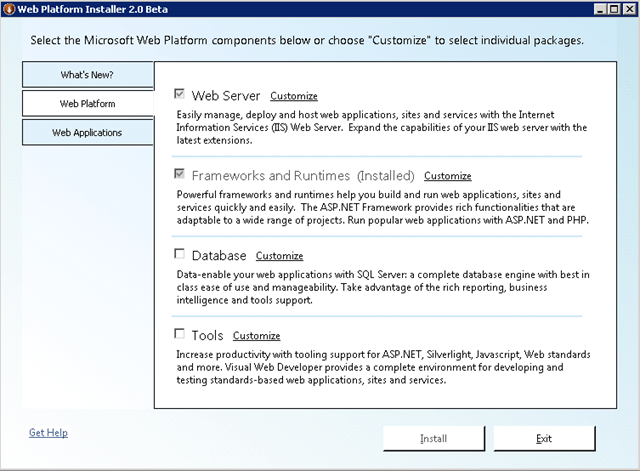 Be Compatible: The application to which you provide a link must run on Windows Server 2003, Windows Server 2008, Windows XP & Windows Vista using best practices on running ASP.NET applications and PHP applications on IIS. 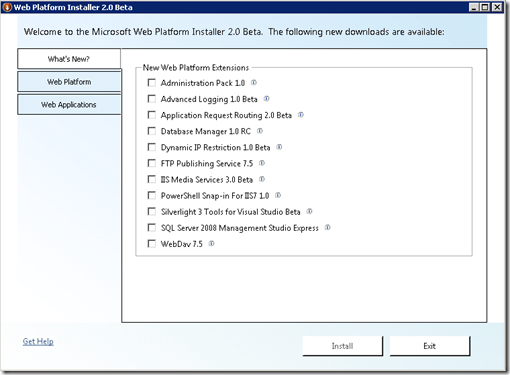 Be Deployable: The application to which you provide a link must integrate with Microsoft Web Deploy as described in the Microsoft Web Application Packaging Guide, and run with the Microsoft Web Platform Installer v2. Be Supported: You must provide a publicly available Web site where end users can download your application, find documentation and/or get free on a best effort basis support through a forum. 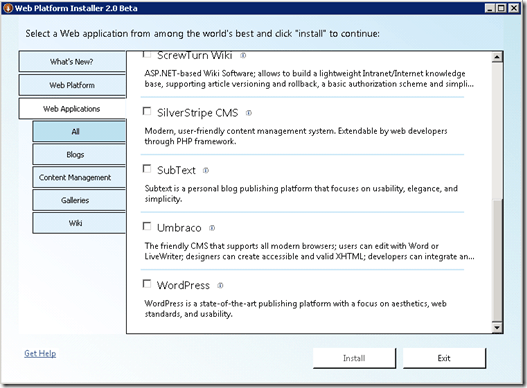 Be Hostable: The application to which you provide a link must run well in a shared hosted environment as well as when the user has administrative rights for the computer. 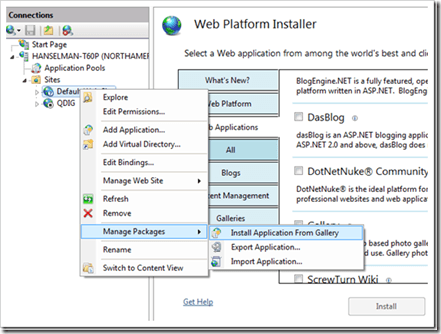 Be Inclusive: If your link is included in the Gallery, you should include a link on your application community’s Web site to your application entry on the Windows Web Application Gallery. 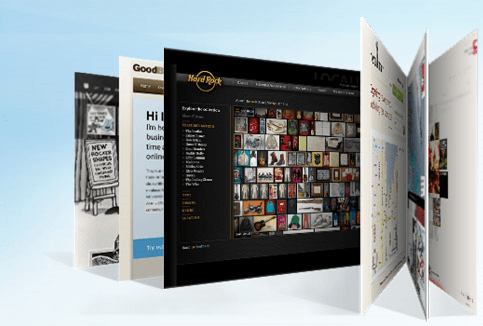 Be Safe: The application to which you provide a link must not harm customers or be malicious, dishonest, destructive, invasive, or act in any manner restricted by the Web Gallery Application Submission agreement. Scott Hanselman hat einige weitere Informationen, auch was im Hintergrund passiert und wie man seine eigene Applikation online stellen kann.